Specialized candle wicks ensure that a candle burns safely and with optimum efficiency. Candle wicks are at the heart of every candle. The wick turns what would otherwise be a lump of wax into a useful light source. The wick is what makes the candle burn and provides the flame. Candle wicks run from the top to the bottom of the candle, allowing the flame to melt and burn the wax from around the wick. While it would appear that the purpose of the candle wick is very simple and straightforward, there is actually a great degree of science behind finding the perfect wick for a candle. If the wick is too thick and chunky, the flame will burn too brightly. This will result in the candle burning down quickly. This is an inefficient use of the candle and is also a potential hazard. A candle wick that is too thin will have the opposite effect. The candle will burn too gently and only the inner part of the candle will melt. This will result in the wick getting saturated with wax and it will cease to burn. Candle wicks are typically sold braided. The number of braids indicates the thickness of the wick. Therefore, a wick with a high number of braids will be thicker than a wick with a low number of braids. Candle supply stores will be able to give more information and supply test wicks if necessary. This is useful when making a large number of candles, as it is essential to get the wick choice right before making batches of candles. What are Specialized Candle Wicks? One of the most common specialized candle wicks is a cored wick. This used to be made with a lead core. However, lead has been banned now in the United States. As such, the cores are now typically made from zinc. Candle wicks with a core are stiffer than normal wicks and are ideal for candles such as votives and container candles. 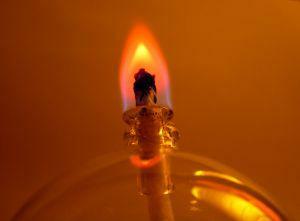 Paper cored wicks are an alternative to zinc cored wicks and have a higher burning point. This makes this type of wick better suited to very large pillar candles. Wicks can be braided to encourage the flame to burn in a certain direction. This means that the wick follows the flame. When a wick burns into itself, it curls into the flame and keeps the end of the wick permanently short. This reduces the amount of smoke that is generated from the candle. Wicks that have a tab are most often found in tea lights. These are wicks that have a small metal disc at the end. The disc helps to anchor the wick in place and stops it from falling over or floating to the top when the wax has melted. Tabbed wicks are either supplied with the tab ready in place or with the tabs supplied separately. Many candle makers prefer to buy the wick in a roll and attach the tabs as required as this gives them the greatest degree of flexibility. Exploring the art of candle making and learning about the best types of specialized candle wicks to use is part of the joy of this fascinating craft.